Namal, our Ella guesthouse owner arranged a tuk-tuk to take us down to the station. To my surprise, there was already about 100 people there and most were tourists. Fortunately for us, everyone was booking secondclass or the viewing carriage. When the train arrived we jumped quickly onto the third class carriage and secured a standing position next to the open door. We needn’t have worried as the carriage was only half full. As the train whistle blew and we moved slowly off, a light shower began to fall. Hopefully it would remain clear and we’d get some good shots of “one of the best train journeys in the world”. It didn’t! So, we hung out of the doorway getting wet to get some video of the trip, but unfortunately, the rain and some heavy fog saw off any ambitions of some great footage to use on the website. Contrary to what we’d been told, the best views are on the north side of the train. At Haputale Station we contacted the guesthouse owner but he couldn’t pick us up. So we negotiated a tuk tuk to take us down the hill about 1.5kms to the Sa Rest Inn, a tiny 2 room guesthouse on the side of the road with a less than salubrious frontage. But, as we’ve found out in the past, never judge a book by its cover! The rooms are brand new, light and airy and have a fantastic view from the balcony out over the tea plantations and out to the coast (which you can never quite see). Our host, a retired army Warrant Officer, was a pretty serious chap and seemingly new at this greeting your guests thing. As the rain set in and the entire area was whited out, we were forced to stay in the room for the rest of the day. Fortunately, our host took his tuk tuk into town and got us some beers and a bottle of Arrack. Just after we arrived, we were joined in the next room by Raphael, a French guy. We took lunch together in the family home behind the rooms and had a good chat. Later, we invited him into our room for some beers as it was still raining. Lunch and dinner were fantastic, Renu the host’s wife is a great cook and dinner was a feast no-one could finish. Renu has 2 sons and an 8yr old daughter, Sonia, who is really cute. The four of them would slip quietly into the living room and watch us eat, as if spying on grazing gazelles that they didn’t want to scare away. A quick “Hari Rasai” (very delicious) would bring beaming smiles from them all! The next day we awoke to discover the rain and fog had well and truly set in. Surprisingly, the road was very quiet overnight and we got a good night’s sleep. I spent the morning with Raphael at the breakfast table swapping travel stories while Shazz got some work done in the room. Eventually, we finally got to walk into town for lunch as the weather cleared somewhat. We chose the Lettuce and Cabbage (out of the Lonely Planet), other choices in this tiny town seemed limited. Up on the balcony, you have a great view of the train coming in at your feet. However, it was too cold and wet to out there and we took our lunch inside, virtually by ourselves. 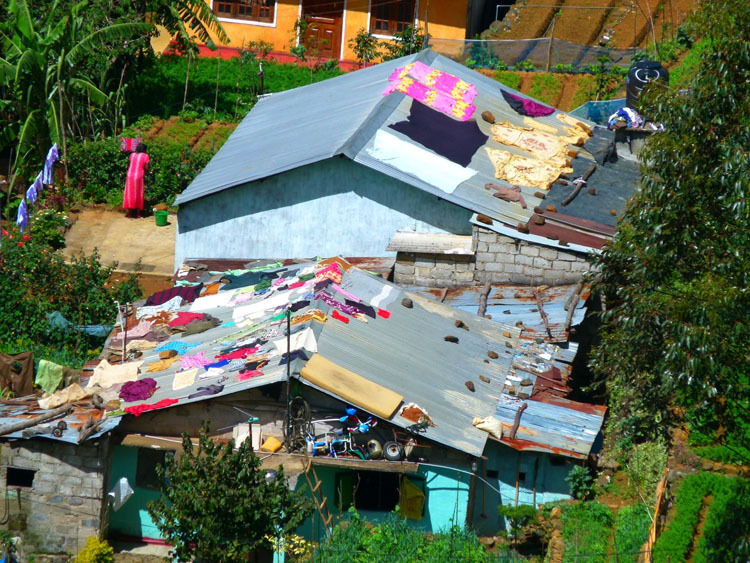 Haputale has a noticeably large Muslim population with a mosque and temple opposite each other seemingly vying for disciples. As we’ve noticed in most towns, mosques are often found directly across from Buddhist and Hindu temples in a kind of discreet but strategic turf war. As in Colombo’s Pettah Markets, Muslim men seem to dominate in the trade of kitsch, Chinese paraphernalia, but can also be seen selling anything from gems to textiles, both common commodities here in Sri Lanka. The next day our host drove Raphael down to Mirissa in his tuk tuk, a gargantuan effort for a tuk tuk (and driver) as they had to return on the same day. We took a tuk tuk to Lipton’s Seat. The weather had cleared up and it was a bright, sunny day at last. It takes about 45mins to get up there via a mountainside road out of Haputale. 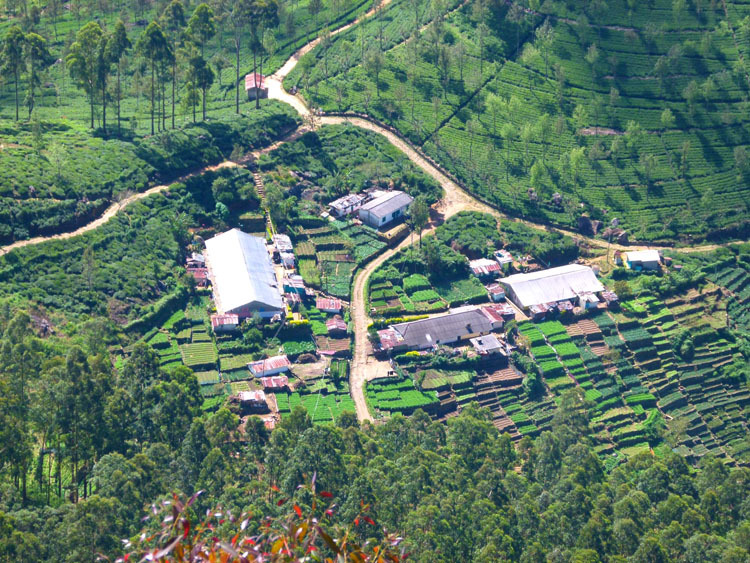 This is the location of the Dambatenne Tea Factory which was owned by Sir Thomas Lipton, the father of the tea industry in Sri Lanka. 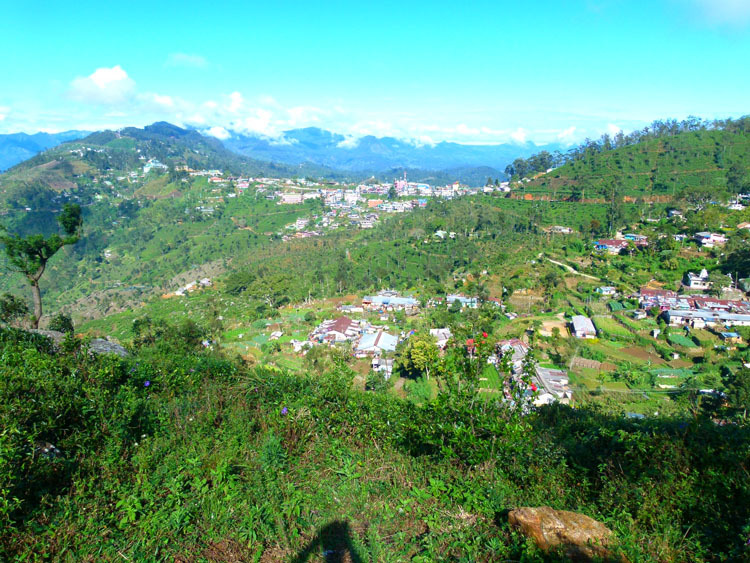 Our tuk tuk driver deposited us at the ticket office (100rps ea) and left us to walk the last kilometre up the steep zigzagging road to the viewpoint. As we had a 9km walk back down the hill, we didn’t really need a 1km walk up to start it off! 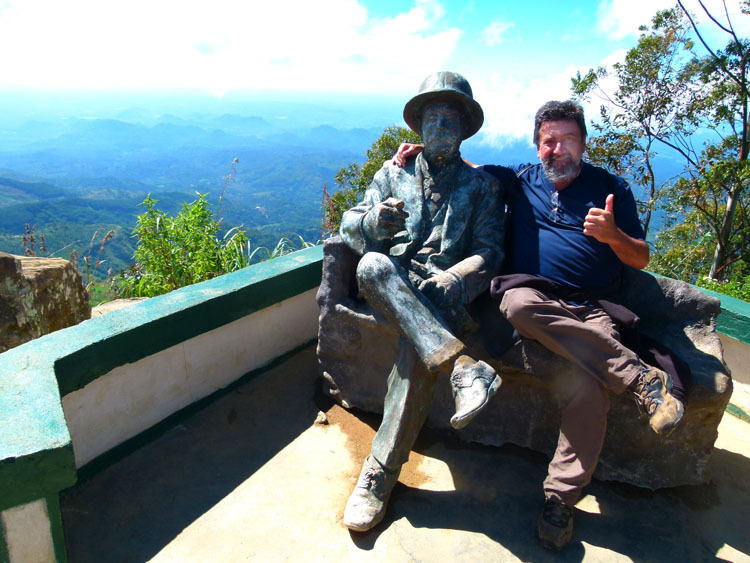 At the viewpoint you can sit next to a fibreglass replica of Sir Thomas and get your photo taken in front of the enormous view. This is the southern end of the central highlands and you can see the ranges gradually peter out into the coastal plains far away in the distance. It’s a fantastic view, but, oddly enough, it runs a poor second to the view at our backs. The 9km walk back down to the nearest bus stop is through so pretty exquisite scenery, the type of scenery you encounter on postcards and in magazines when reading about this place. Ironically, the landscape is completely man-made (except the steep slopes). 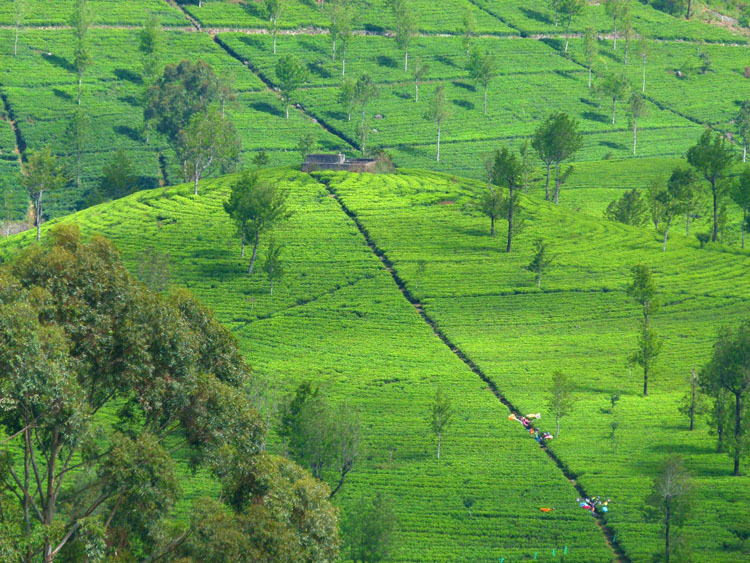 Tea plants stretch like a vibrant green carpet over the entire hillsides, barely a square inch not utilized. Clouds passing overhead gradually change small patches of bright green into a deeper shade creating a patchwork of different coloured greens with highlight effects. It’s a sight to behold and we had it virtually to ourselves for the next 3 hours. Being a fine day, the ladies were out on the slopes picking. This is usually a woman’s job as they are considered to be better at it than the men as women’s hands are small and dexterous and therefore better suited to the job, although this is not always the case. The guys usually do the pruning. We stopped and said hello in Sinhalese to a couple of the nearest ladies and were a bit surprised to have initiated a conversation in very good English. The ladies were happy to pose for a photo, which was great! 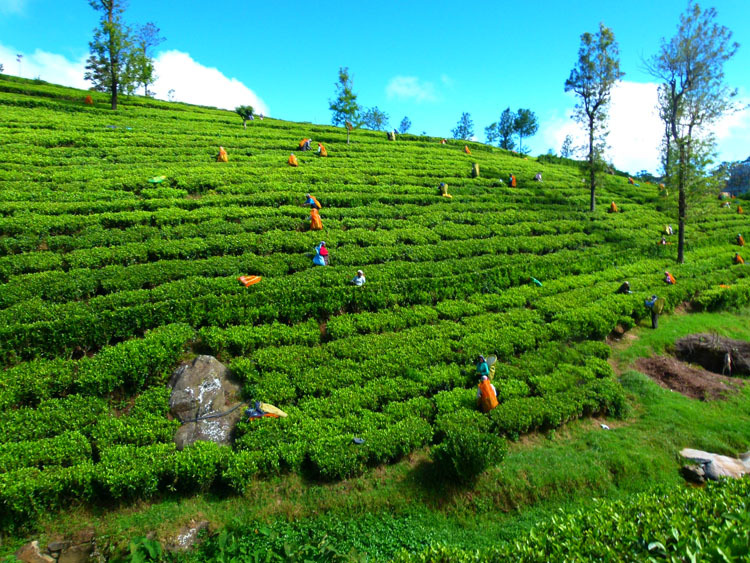 The walk can also be shortened by taking a shortcut through the tea plantations and avoiding the switchback road. This means descending almost vertically down some pretty random steps that are used by the workers to access the tea plants. As this would be a killer for our ageing knees and joints, we wisely stuck to the narrow road and enjoyed the scenery – we were in no hurry to leave this place on such a good day! Down at the second village, we had a cup of tea opposite the imposing Dambatenne Tea Factory and waited about 30mins for the bus for another white-knuckle death ride back around the mountainside to Haputale. 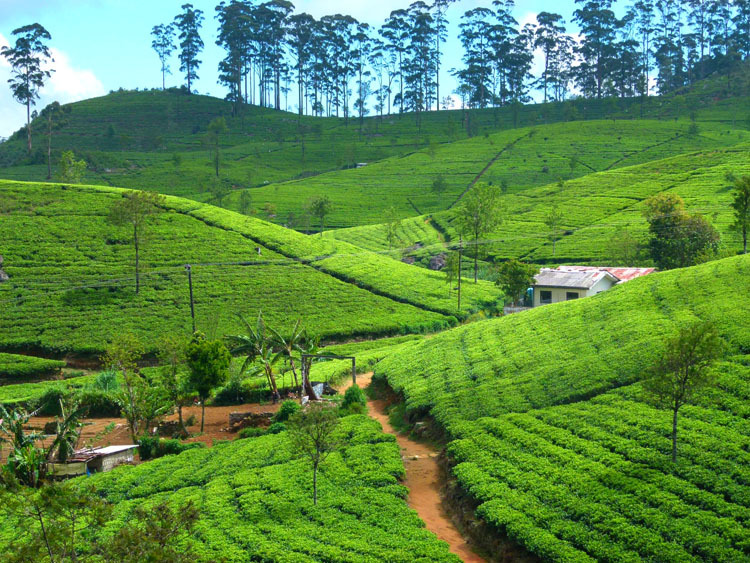 The best views from the famous Kandy to Ella train journey are on the northern side of the carriage (from Haputale to Ella at least). 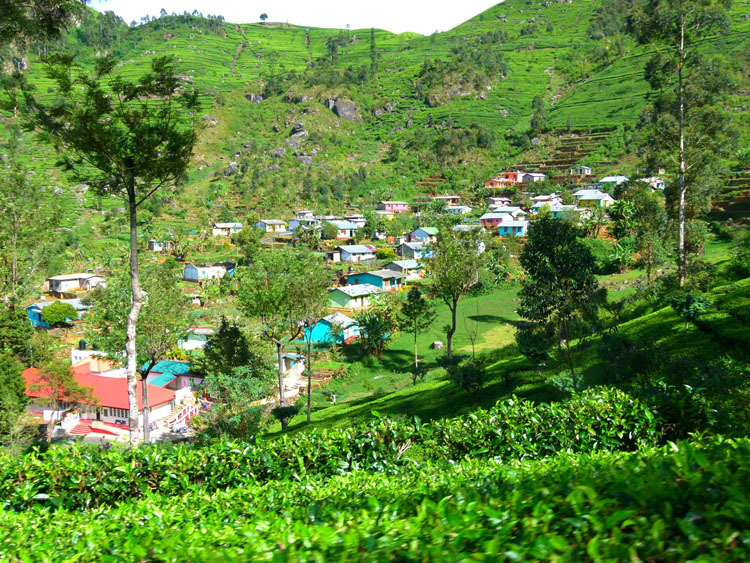 If you take the early train from Ella to Haputale, you could manage to do the Lipton’s Seat walk and then take a later train (there’s 5/day) to Nanu Oya where you can hire a tuk tuk to take you the 10kms to Nuwara Eliya. NB: Nawara Eliya is NOT on the train route. If you take a tuk tuk to Lipton’s Seat, make sure the tuk tuk driver takes you all the way to the top (1km past the ticket office). 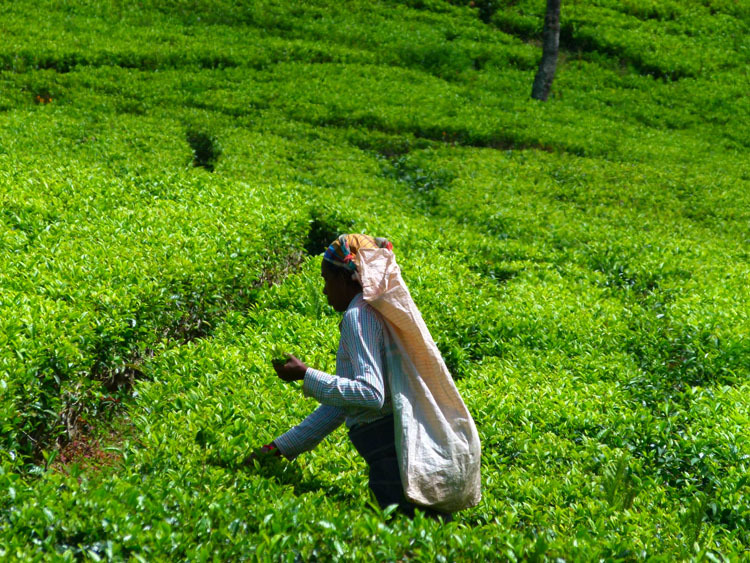 If you’re still up for it, you can do the Dambatenne Tea Factory tour when you finish your walk.